In 1993, Woodside, which sits on a knoll overlooking the village of Buckingham Court House, was added to the National Register of Historic Places. 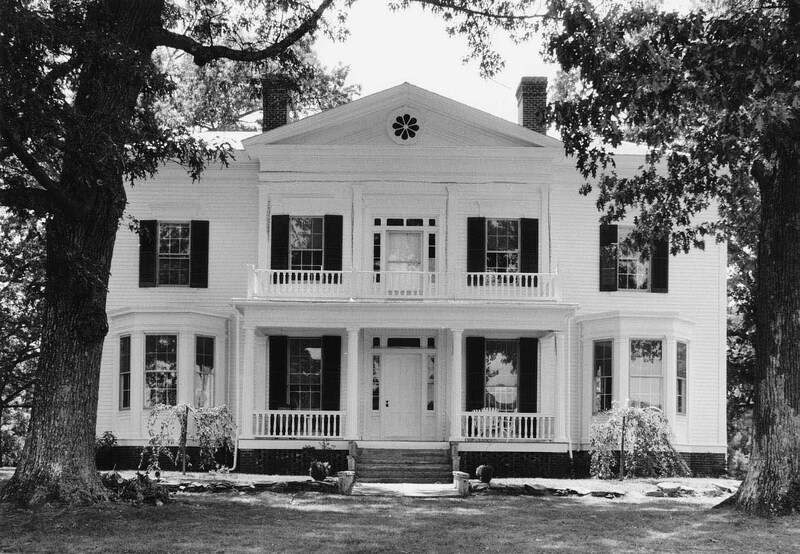 This two-story Greek Revival house was built in 1859-1869 for Dr. William M. Swoope and is a beautiful reminder of elegant, 19th-century living which few in Buckingham County could afford. From 1871-1882, Woodside was the residence of Nicholas F. Bocock, a prominent local lawyer, and his heirs. He was the brother of Thomas S. Bocock, another Buckingham Notable. My name is Barb (Swoope) Taylor. Dr. William Swoope was my Great Great Grandfather. My brothers and I were fortunate to see his father’s property in Swoope Depot last year. We are in West Virginia and Georgia and are planning another trip to see the Swoope Family Cemetary and would like see your beautiful home, Woodside. We would not want to be intrusive but could just see the outside and the grounds. We are planning a trip sometime in May or June 2019. Please let me know if this might be possible. Thank you! I forgot to add: I think that Dr. Swoope’s first wife died (records are sketchy) and he married again as he had young children. He remained in the County, so one wonders if he sold the house (shortly after completion) because the new wife didn’t want to live in the house he had built for the first wife. Just speculation, obv. What a wonderful story! It truly is a beautiful house! I can only imagine what it looked/s like inside! Woodside is such a beautiful house! How fun to know that your mother grew up there and I delighted to learn that you were able to tour inside. Oooh! My mom grew up in that house! My great-grandparents lived there from 1940 until shortly befre my great-grandmother’s death in 1987. My GGF died in his room there in 1976. The story goes that my GGM loved that house growing up because when she was in high school she used to stay there for sleepovers with her best friend whose parents owned it. It was recently for sale and some of us were able to go through it again. It is still beautiful inside! Would love to chat with you about it. My email is Kimberly Bucher Maher at gmail dot com (just smoosh it all together). You and I have actually spoken on the phone. I am Kimberly’s mom and lived in the house for about 1.5 years in 1949-1950. Went to first grade in the same school house that my mom did. It is now an art gallery I think and can be seen across the creek from Woodside. My mom’s class was the last class to graduate from that school. Central High then became the county high school. I made an offer on the house several years ago because I would like to have gotten it back in the family. My mom was still living at that time and it would have been nice. My Mom and uncles knew Miss Mabel Swope one of Dr. Swope’s daughters by his second wife I think. She taught school and I’ve heard her name all my life but never knew that her father built the house. Ruth Swope(I think her name was Ruth), one of Dr. Swope’s daughters, married a Hall and Tom and Charlie Hall were her sons. They were in school with my Mom. My Mom didn’t realize that their grandfather built the house. My Mom didn’t grow up in that house though. The family moved there in the early 40s. But it is the home I went back to for visits my whole life until my Grandmother died in 1987.
like I could call you. I don’t want to put my number on this site.